We need ambassadors to help spread the message of love and unity throughout the world! 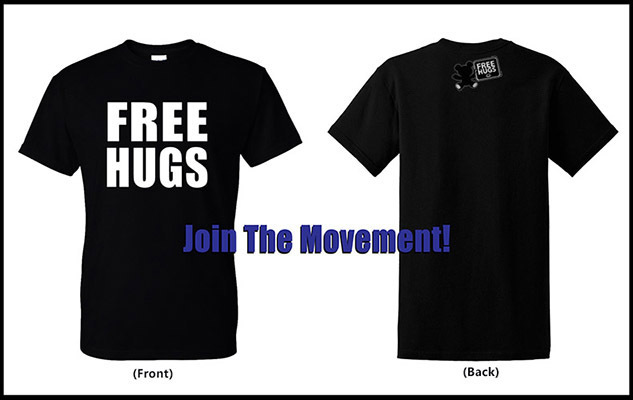 100% of the proceeds from Free Hugs T-Shirt sales are used to fund our video projects to raise awareness of social issues. He’s the guy in those online videos wearing the shirt that reads “FREE HUGS” with a matching, hand-held sign, and offering hugs to runners during races. He’s also hugging police officers working at those races, and most famously, opening his arms to supporters at a Donald Trump rally and a Bernie Sanders rally. Ken Nwadike Jr. is the face of the Free Hugs Project (he’s so recognizable at this point that when he’s walking through the airport — or even our office for his interview — while wearing that particular shirt, people fling their arms open and approach him for a hug). The initiative to spread love, inspire change and raise awareness of social issues began in 2013. With his Trump/Sanders rally video, his #MakeAmericaLoveAgain movement has been viewed more than 100 million times and picked up by major media outlets. His hope is that people who see his videos will make a conscious effort to be more kind and connect with others. Nwadike is not just a guy who gives hugs to strangers. He is “The Free Hugs Guy.” The guy whose YouTube videos showing him dispensing hugs at political rallies, police-shooting protests and other high-profile gatherings have amassed more than 150 million views. The in-demand motivational speaker whose appearances at schools, colleges and companies help finance his hugging travels. And in this year of polarizing politics and a rash of police-involved shootings that have left communities in turmoil, Nwadike is the sincere, gregarious guy who has become an island of hope in a sea of noxious negativity. What looked like a mistake has become a mission.